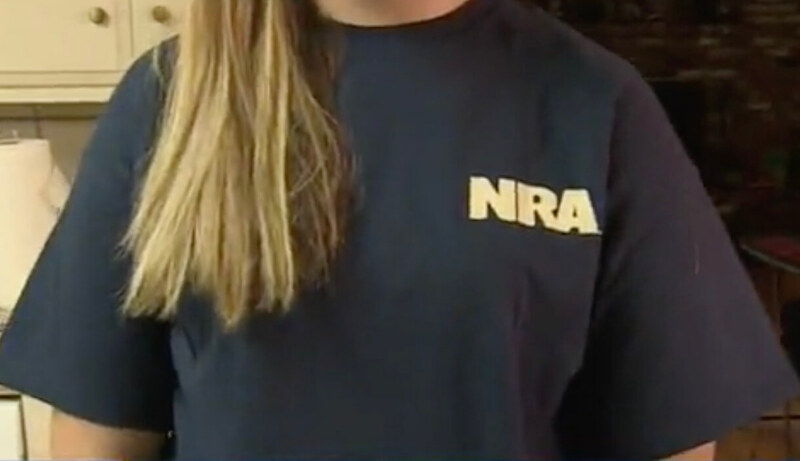 How do you make kids being kicked out of class simply for wearing a shirt that supports the National Rifle Association more infuriating to conservatives? How about if that shirt had an American flag on it? That’s the double-whammy that’s triggered a whirlwind of opprobrium against the folks at Lodi High School in California, where a history teacher decided to boot one kid from class and lecture another because they were wearing T-shirts featuring the logo of the pro-Second Amendment organization. “She was basically being attacked in class,” Charlene Craig, mother of one of the students, told KXTV-TV. The two sophomores say that they were singled out by the teacher who decided to instruct them on the horrors of exercising your constitutional rights. Do you think this teacher overreacted? At least Craig’s daughter just received a lecture. The other kid was sent to the principal’s office for refusing to take the shirt off. Craig said that the policy is slight to farming and hunting families that live in the Central Valley community between Modesto and Sacramento. “That’s what she is, that’s what she does,” Craig said. A school dress code says that no clothing featuring weapons may be worn. However, there’s no gun here — merely the bullets, and I somehow doubt anyone as anti-guns as this teacher was would even know what the flag was comprised of, quite frankly. Meanwhile, wear a shirt featuring Che Guevara, a man responsible for the deaths of an untold number of people, and that would probably be fine. This is California, after all — the land of Maxine Waters where the Bill of Rights and macroeconomic truths are considered to be horribly outdated notions. A statement from the Lodi Unified School District said that “the school administration reviewed the t-shirt in question and determined that it did not violate school dress code policy.” They added that administrators would be given a refresher course in the dress code to prevent future incidents like this. In the meantime, Craig says the history teacher is going to have to stare at T-shirt for quite some time to come. I don’t either. And, if anyone does get triggered, perhaps they should be forced to write an essay on why the NRA is so important. Two pages 12-point Times Roman, please, and don’t try any funny stuff with the margins.